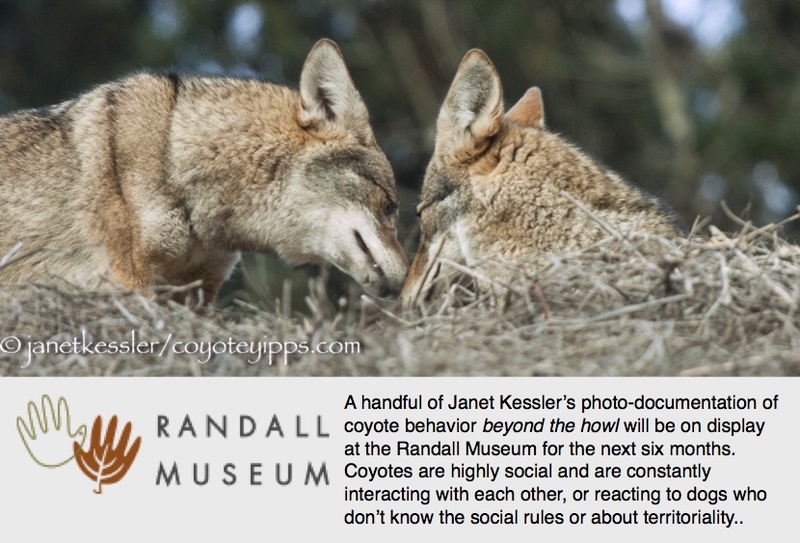 The courting behavior of these coyotes usually entails the fellow following and keeping tabs on his gal. She is more aloof than he is, but she seems to like his attention — as long as it’s a “hands-off” affair. Not until her cycle is ready for him will she permit very close contact. This sequence of photos, taken during an extended observation period in January, illustrates this behavior. So many photos: I find individual photos much more revealing than a video — they stop the action and let me reflect on what is going on. I tend to click continuously as I observe, which allows me to record the whole story, and allows me to review what happened in a short amount of time which wouldn’t be true for a video recording. I then simply pick out whichever photos tell the story. My trouble is in eliminating some of the photos for my story! So, there are a lot of photos here — hope you aren’t overwhelmed! He finished his meal, urinated (marked) on the spot, and trotted over to be closer to her. She looked away uninterested. So he settled down not too close, and not too far away — about fifteen feet away and waited. And waited. And waited. And waited. I think her need was for him to respect a certain distance. Once she was happy with him showing this respect, she felt free to move around. She finally got up and stretched, ho-hum, ever so casually, like he didn’t matter, shook off the rain and walked over to where he had eaten his gopher. He watched her go, and soon got up and followed. He then walked to the rock on which she had been lying. It’s as though they were each checking out every detail about the other — coyotes can pick up a lot of information with their nostrils. He again looked over at her and she at him. See below. The coyote pair stopped following as the walkers distanced themselves — the people and their dog were not interested in the coyotes, and this is all the coyotes wanted to know. The male urinated his displeasure when a runner went by, and the female just settled down to watch the male coyote who took off into the distance. She watched him go and then got up, nonchalantly stretched in her ho-hum manner, and disappeared into the bushes at about the same time that her mate disappeared from view. Where did you observe this? I’ve seen a coyote in Daly City, but never in SF, and I’d love to be able to watch their natural behavior from afar as you did here.